Edward Hopper (July 22, 1882 – May 15, 1967) was a prominent American realist painter. While known primarily for his oil paintings, he was also a watercolorist and printmaker. Hopper derived his subject matter from two primary sources: one, the common features of American life (gas stations, motels, restaurants, theaters, railroads, and street scenes) and its inhabitants; and two, seascapes and rural landscapes. 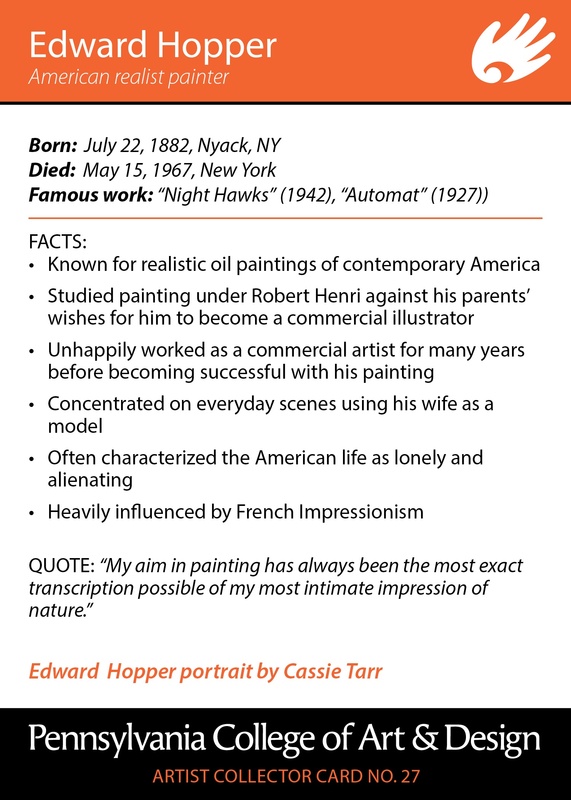 Hopper was born in Upper Nyack, New York, and showed talent in drawing at age five. By his teens, he was working in pen-and-ink, charcoal, watercolor, and oil. Hopper's parents insisted that he study commercial art to have a reliable means of income. Hopper studied at the New York School of Art and Design and he modeled his early style after his teacher there, William Merritt Chase, and French masters Édouard Manet and Edgar Degas. In 1905, Hooper created cover designs for trade magazine for an advertising agency, work he disliked. During this time, Hopper began painting urban and architectural scenes in a dark palette. Following trips to Europe, he shifted to the lighter palette of the Impressionists before returning to the darker palette with which he was comfortable. His work was slow to catch on, and Hopper worked by necessity as an illustrator. During the early 1920s, his etchings, including Night on the El Train (couples in silence), Evening Wind (solitary female), and The Catboat (simple nautical scene), began to receive notice. Two notable oil paintings of this time were New York Interior (1921) and New York Restaurant (1922). His wife Josephine Nivison, a former classmate, managed his career and his interviews. With her help, six of Hopper's Gloucester watercolors were admitted to an exhibit at the Brooklyn Museum in 1923. One of them, The Mansard Roof, was purchased by the museum for its permanent collection for the sum of $100. His financial stability now secured, Hopper no longer lilied on illustration work, but was able to develop his distinctive style. 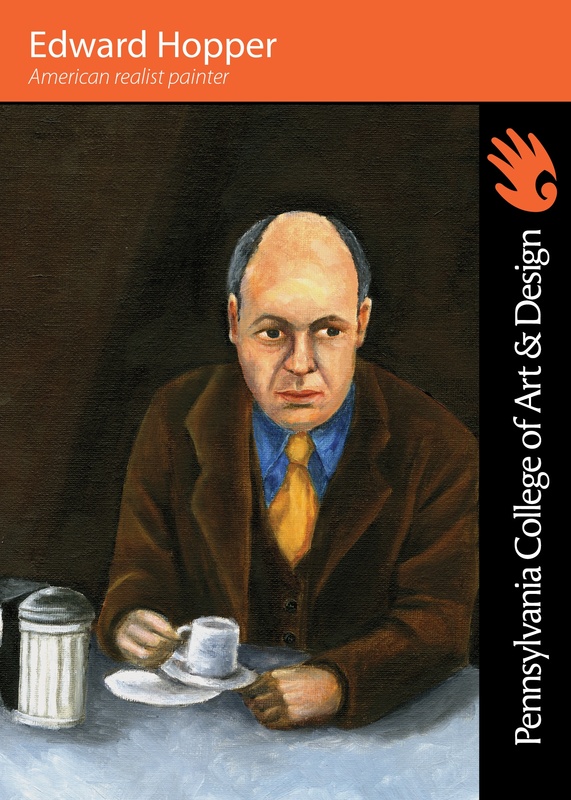 Despite the Great Depression, in 1931 several major museums, including the Whitney Museum of American Art and the Metropolitan Museum of Art, acquired his work for their collections. The following year he participated in the first Whitney Annual, and he continued to exhibit in every annual at the museum for the rest of his life. In 1933, the Museum of Modern Art gave Hopper his first large-scale retrospective. Hopper died in his studio in New York City on May 15, 1967. Other significant paintings by Hopper are held by the Whitney Museum of American Art, Museum of Modern Art in New York, The Des Moines Art Center, and the Art Institute of Chicago.